Hi! I'm Tayler from Our Fairy Tale! I'm super excited to be guest blogging on Stephanie's blog today! I am an English and history teacher who loves to cook and is starting her second year of marriage! Three years ago, I traveled to Wales on a language and history study abroad. There, I learned an interesting fact! I learned this in Wales, when during my inclusive course, they served us shephard's pie at the beginning of the week, then cottage pie at the end of the week! So, for all you Americans out there, this is ground beef pie. 2) Cut up the onion and sautee it as you cook the ground beef on medium-high heat. 2) As you are cooking the ground beef and onion, sprinkle the nutmeg, all-spice, and ginger in and mix it up. 3) Once the beef is fully browned, Do not drain the beef! 4) Mix in the veggies with the beef in the pan. 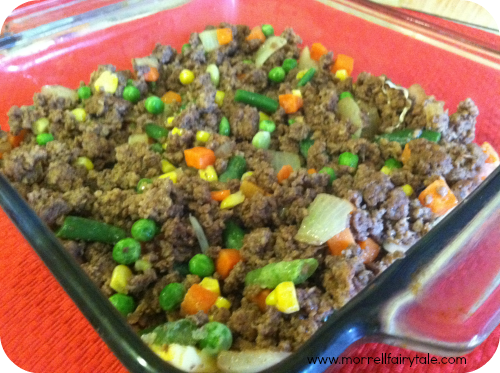 5) Take an 8x8 casserole dish and pour the veggies and beef in. Make sure to drizzle it with the left-over grease/juice left from the beef. 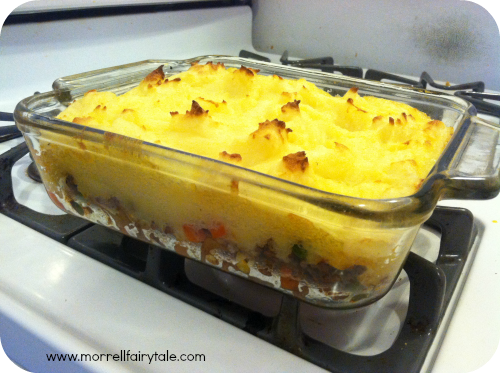 This is important, otherwise the beef will dry up in the oven and you want your cottage pie moist and juicy! 6) Cook your instant potatoes! Follow the directions of whatever brand you have, and make sure to make 2 cups worth of instant potato flakes! 7) Mix in the 1/3 cup of cheese. 8) Pour the cheesy potatoes on top of the beef and veggies. 10) Pop it in the oven for about 20-30 minutes, depending on how fast your oven is. When the tops of the whisps are brown and crispy, and the rest of the potatoes are yellowish, it is finished. It should look like the above picture. 11) Spoon it out and enjoy! 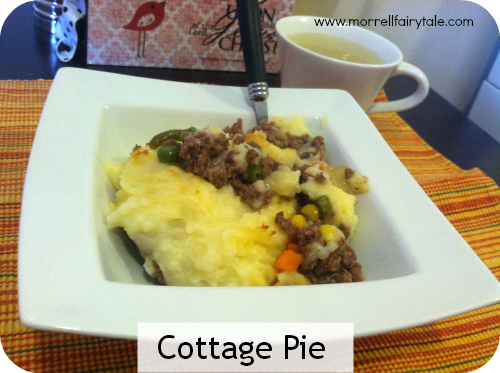 Come see some of my other delicious recipe!